Sanctuary is one of the digitally serialized comics coming out from SLG Publishing. Stephen Coughlin has created a story he calls a “Disney murder mystery” personalizing a group of animals kept in a park-like animal sanctuary. I found it funny, suspenseful, and well-cartooned. The animals are treated like people, with their own personalities and motivations, and while that’s unrealistic, it’s also entertaining. It reminded me of something like Madagascar … until the research scientists revealed their darker sides. 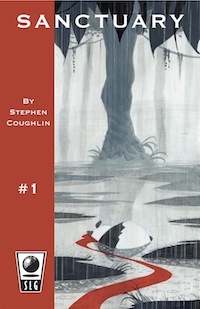 That sets the tone for the rest of the series, which turns into a murder mystery when the newly arrived panda is killed. In issue #2, the animals try to figure out what happened while the humans conduct their own investigation under the guise of improving human/animal communication. Along the way, characters ponder the meaning of life and death and how close the two are to each other. Coughlin’s got an animation background, which explains how expressive his creatures are. His tigers, giraffes, lions, and gorillas are quickly understandable to the reader, worried about their mates and their offspring and how to cope with their captivity, even minimally seen as it is. In addition to figuring out what happened, who’s behind the killing, and the ethics of their actions, there’s a good deal of psychology and observation, as you’d expect from a comic set in a research facility. While I want to find out what’s going on — especially once the creepy spiders show up — I’m just as interested in the relationships among the animals. There are four issues out so far, and you can read the first one for free in your choice of PDF, CBZ, or ePub format. The remaining issues are available for 99 cents each through SLG directly or comiXology. I recommend them.